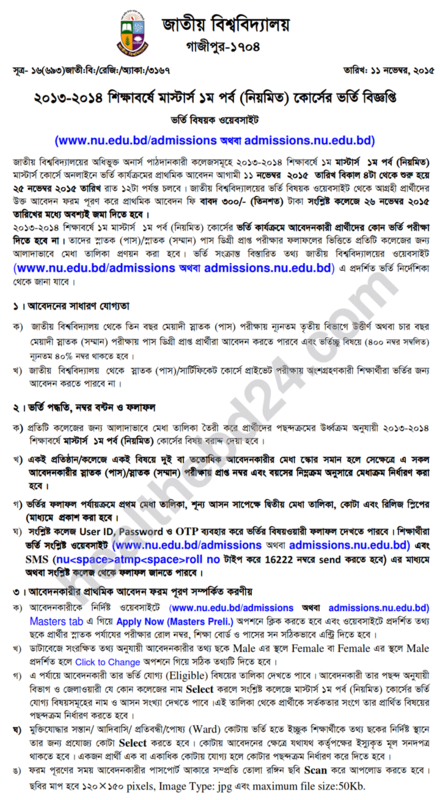 National University Masters Part 1 admission Circular 2013-2014 | www.nu.edu.bd. National University Masters Part 1 Admission Notice and Masters Part 1 Admission Result will be found here. Masters Preliminary Admission Notice 2013-14 has been published. Admission Procedure will start from 11 November, 2015 and continue up to 25 November, 2015. The interested candidates will have to apply and submit application form through online within this time. Online Application Start: 11 November, 2015. 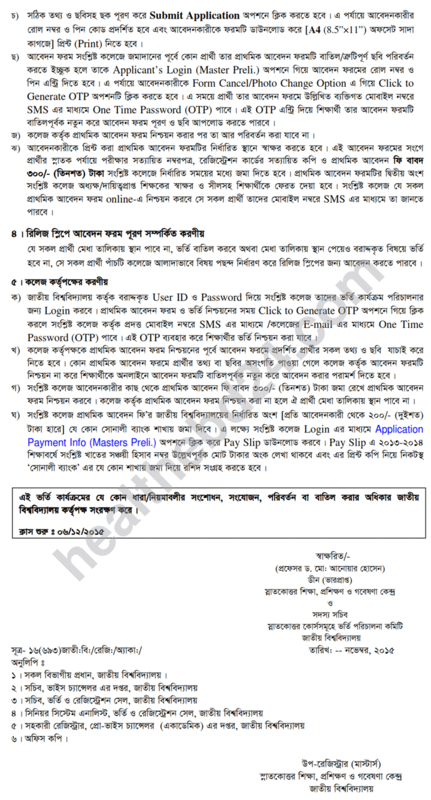 Online Application End: 25 November, 2015. Submission of Application Fee (300 Tk) to College: 12 November, 2015 to 26 November, 2015. Application Form Verification by the College: 12 November, 2015 to 28 November, 2015. 2) Those who passed Honours Exam from National University. 3) The candidate should have at least 40% marks in the subject in which he/she want to get admitted. No admission test will be held. National University will publish Masters Part 1 Admission Result 2013-14 1st Merit List, Masters Part 1 2nd Merit List, Masters Part 1 Quota Result and Masters Part 1 Release Slip Result consecutively. NU Masters Part 1 Admission Result 2013-14 will be found here after publication. Like Our Facebook Fanpage facebook.com/resultnotice to get the latest updates of National University Masters Part 1 Admission Result 2013-14 and get future updates. This entry was posted in Uncategorized and tagged Masters Part 1 Admission Result 2013-14, Masters Part 1 Admission Result 2015, Masters Preliminary Admission 2015, National University Masters Part 1 Admission Notice 2013-2014, National University Masters Part 1 Admission Result 2013-14, National University Masters Part 1 Admission Result 2015, NU Masters Part 1 Admission Circular 2015, NU Masters Preliminary Admission Result 2013-14, www.nu.edu.bd, www.nu.edu.bd/admissions by Result Gov BD. Bookmark the permalink.